Greetings from the staff, students and members of the Wotutu congregation. We thank God for today and for you over there in your homes and your congregation. This is sister Mercy. She is having triplets all boys. 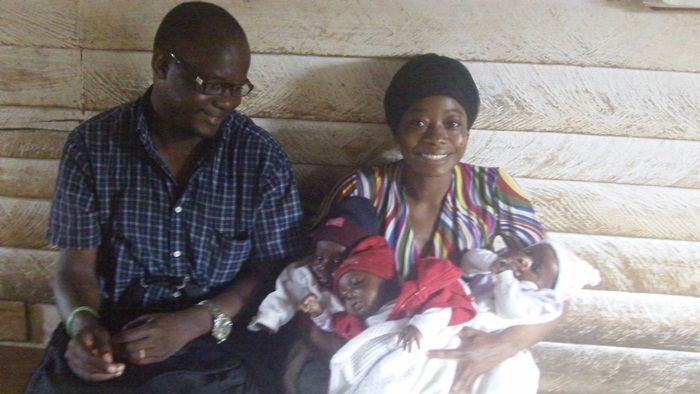 The unbelieving husband abandoned her with these precious and innocent children from God, the load is too much for him. As I write this mail to you, this sister nor anyone in the community knows where he is. Please as I write this report, I am making an appeal for these young boys who may turn tomorrow to be wonderful vessels for the Lord to use tomorrow for His glory. The children and their young mother need your help of any kind to afford food and medical attention for their survival. Please if you are touched to be part of this humanitarian help, then we wait to read from you and to make further explanations about this pressing need. The work entrusted in our hands continues to grow and we appreciate God for His help. The rainy season continues to make our movements to preach and teach difficult, but we are being encouraged daily by the word we preach. Last week our topic for chapel services in CBIW was “Excuses.” We do our best to encourage ourselves not to make excuses that will not bring glory to God or help us move ahead to help grow our ministries away from us. The topic was to challenge one another to sacrifice for one another rather than making excuses. By His grace all those who went out for weekend evangelism returned on campus safe and sound, except for me. I returned in severe pain because of the nature of the road that I and some students used to go for mission work. I was on the road trekking to Mbakwa Supe Village along Mamfe road for mission. The rainy season is still heavy and the roads do not support the four wheel vehicle to plough the road, but the gospel is for all. We must go wherever we are called to go so that we should not give excuses and on the other hand help many there not give excuses that no one came to tell us the truth. If you are going, your journey is not certain because of the nature of the road. Many will spend many days or weeks on the road because big trucks will be stuck down in the mud and the whole road will be blocked until it is clear or towed by another vehicle of greater capacity. This should not discourage us to go where the saving message is calling. The Lord brought 7 Christians who had fallen away back to the fold and the Lord added a soul in our young congregation in Mbanga. Keep this work in your prayers. We were able to preach from house to house and answer question on the street in Mbakwa Supe Village. It was great and very exciting to preach to people who will open their hearts and stopped whatever they were doing to listen keenly to the message that goes into hearts of men. We need follow up after sowing seeds like these. They said with readiness of heart “come over to us and help us go to heaven.” Oh the field is really ripe but the laborers are few. 1) We are still continuing with our weekend evangelism and we shall make a joint campaign to Batoke Village if the means are available which will also help us establish a new congregation. 2) We are also planning for a mass campaign in Mbanga congregation before graduation. 3) Our graduation in CBIW will be on the 20th of December 2012 and our second batch of students will matriculate the same day. Please make your plans to be part of this august ceremony in Cameroon. Many thanks to God for His great care over us and the work we are doing. We thank you for your help and all your prayers toward this work. God bless you for availing yourself for His service. Please do your best to share this report with others who may love to be part of the program and our appeals. God bless you and all that you do. Posted on October 15, 2012 by Bob Turner and tagged Cameroon.